Blog A Book Review: "StrengthsFinder 2.0"
When things aren’t going as smoothly as we planned or in the direction we imagined; when we find our life and our business a far cry from what we have envisioned, our mind defaults to the thought that something needs “fixin” – that is Texan for the verb “to fix.” What is wrong, what is broken, what do we need to fix? We have a proclivity to zero in on our weaknesses. If business isn’t what we think it should be, well, it’s our marketing skills that need a fix. Better sign up for that networking course or figure out how to get that blog going. I’d like to offer an alternative, StrengthsFinder 2.0 – a book that focuses on what is “right” with you and those around you. Why is understanding your strengths so important? Have you ever heard the phrase “coming from a position of strength”? It is far more desirable to be coming from a strength rather than a weakness as you begin with confidence, aware of your capabilities. It allows you to focus your efforts where you know you can have the most impact. It helps you recognize why certain things are frustrating or extremely time consuming for you. Typically, these are not strengths and would take a great deal of time and energy to “fix” in you. Ideally, you would “outsource” those things you are not strong in and focus your energy on the things you do best and where you add the most value. Another great benefit of understanding your strengths is to confirm what you already knew. Yes, it is validation of what you intuitively felt and likely did not trust yourself enough to believe in. That’s where the voices in our heads, and other people’s voices, can cause us to discount our value and ability to contribute. Simply knowing your strengths does not alleviate that marketing challenge mentioned above. What it does provide is the tool to begin thinking about your marketing differently. What strength can you use to develop a marketing strategy that fits you, which in turn provides those you meet with an “authentic” picture of who you are and what you do? Sounds far more appealing than an “elevator speech,” doesn’t it? 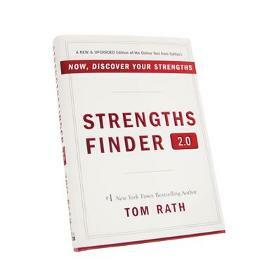 You can learn about your strengths through the book, StrengthsFinder 2.0 by Tom Rath, and by taking the CliftonStrengths® assessment. The assessment is accessed by a code found in the book. The book incorporates the research and studies of Dr. Donald O. Clifton, who is recognized as The Father of Strengths-Based Psychology and is the creator of the assessment. If you prefer a more personal interaction, give me a call 713-705-3815 or email. By the way, my Top 5 Strengths are Maximizer, Strategic, Positivity, Futuristic and Woo.